If you have any questions or want to enquire about dates, use our form to contact Denise Longley or see their website for more information. Denise’s Bothy is a one-off: chock a block with interesting stuff and infused with her warmth and creativity. Solid, small and simple it hunkers happily on its hillside overlooking golden green fields to Anglesey (a 15-minute drive) with the mountains of Snowdonia standing sentry behind. You can climb the largest mountain in Wales – Snowdon – from Llanberis (two miles away) or lazy loafs can take the train! There’s heaps of other outdoorsy things to do: kayaking, paddle boarding, white water rafting; or potter round a National Trust spot – Plas Newydd or Bodnant Gardens are lovely. Head home to get cosy by the wood-burner, fix supper in the narrow kitchen then up to the low raftered mezzanine to sleep deeply in a chunky bed (made by Denise) covered with a nostalgic patchwork quilt. Quirky and characterful: find rope and branch handrails, lime plaster walls and rugged larch floors. Pots of colourful flowers border the lawn, animals mooch about, the scent of herbs wafts through the kitchen window. A rural retreat for a laid-back couple (if you’re looking for mod cons and manicured perfection you won’t find it here) between the mountains and the sea. Minimum stay: 3 nights. 2 nights at weekends. We had a lovely weekend at the Bothy! It really is a beautiful peaceful place. We felt very much at home and enjoyed getting to know Smudge the cat. Denise made us feel super welcome, lighting a fire for our arrival and leaving some tasty treats. Perfect place to come back to after a windy cold hike up Snowdon, would definitely recommend and we will be coming back! Beautiful days for long walks. Nights clear and cold, but snug here in the bothy with wood stove roaring. Lovely memories of standing in the kitchen barefoot on underfloor heated flagstones. Mmmmm! A great stay Thankyou. A lovely, quirky little bothy and a great area to stay. Denise is a very welcoming and thoughtful host. We stayed at the Bothy over a weekend. with my girlfriend. When we arrived we were given a warm welcome by Denise. She was super friendly and suggest several places to visit. The accommodation itself is cosy and finished to a high standard, all the decoration is thoughtful and very fitting. It is clear to see that that Bothy has been restored with love. A great place to relax but also conveniently placed to explore the delights of North Wales. We would highly recommend and will 100% be returning. A delightful place to stay. The Bothy's restoration is just perfect a real home from home, cosy and welcoming, so much detail and love has gone in to the Bothy, it is a real treat to stay there, you will not be disappointed. It has fantastic views from the kitchen and patio area. The location is super we visited Llanberis, Conwy, Betws y Coed, Bedgellert and Anglesey which has fabulous beaches. We highly recommend this Bothy. Very convenient location. Good meals to be had in The Peak Restaurant and Dyllons. The top of snowdon on the train was a fantastic trip. The electric mountain and the slate quarry were also well worth a visit. Portmerrion and Anglesey also. A great holiday. What an amazing place and a wonderful host! Booked the Bothy as a surprise weekend away for my fiances birthday and it was like a home away from home. Lovely little touches everywhere, including a welcome tray of welsh goodies. Denise is an absolute delight and it was a joy to spend time there. Cannot recommend highly enough. Had a wonderful holiday at The Bothy in the run-up to Easter. Denise and Smudge (friendly tabby cat) were very welcoming. The wood burner had been lit before we arrived and, after a long and tiring journey, it was lovely to find some Bara Brith, a wedge of local cheese and a bottle of local beer waiting for us. The views from the kitchen are amazing - ponies in the foreground and Anglesey in the background. The Bothy itself has been beautifully restored, is compact, cosy and well-equipped. Had a lovely stay at the Bothy. Denise is very friendly and made some great suggestions of walks we could do. The cottage is beautifully done and very cozy. 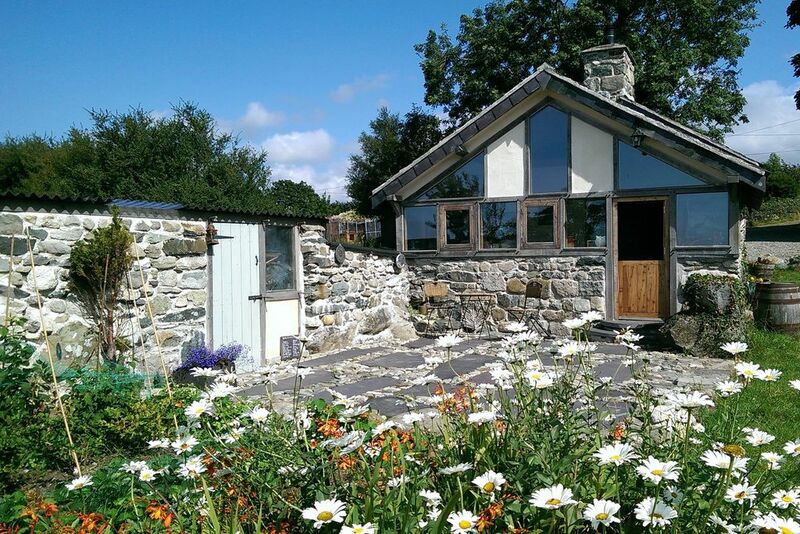 It is ideally located for exploring snowdonia. Absolutely wonderful. Denise is a very welcoming, helpful & delightful host. The Bothy is beautifully restored, facilities excellent. Excellent wifi reception. Great patio, with views of Angelsey in the distance,for sundowners in the evening sunset. Great location for exploring Angelsey & Snowdonia. Co- op & good butchers in the village for provisions. Wonderful views of Snowdon from entrance gate, Llanberis only 10 mins away. Very comfortable bed in hay loft, great log fire and under floor heating in shower room & kitchen. Simply perfect for us. A very special place! We will return again. The bothy is one of north wales hidden gems a small peace of heaven on earth .We did not want to leave. Denise gives such a warm welcome and is always on hand if you need any help. The bothy has all the mod cons you need during your stay and yet it still feels like you have stepped back in time . The log burner is lovely to curl up to after a long day . There a few shops a 20mins walk down the road which is very helpful . There are many things to do near by so the bothy makes an ideal base. We really don't want to tell anyone how good it is as we don't want to share this amazing place. Thumbs up doesn't begin to describe the joy we had from staying at the Bothy. The cottage is beautifully restored and a briljant place for self caterers who wish to explore Snowdonia. Denise is a warm hearted host, willing to share a very special place. As a bonus we had a view of the horses and daily visits from house cat Smudge. With a wood stove easy to operate we were able to create that special atmosphere that made the Bothy a "home away from home". We gladly recommend this place to everyone who loves Wales! We really enjoyed our stay in the bothy. It has been well renovated and is full of rustic charm. It contains everything needed for a comfortable stay. The setting is lovely in the foothills of Snowdonia and it catches the evening sun on the patio area. The wood-burning stove makes for a cosy evening indoors or there are restaurants and pubs in nearby Llanberis and Caernarfon. It is ideally situated for an active holiday in the mountains or for more leisurely sightseeing around the historic and archaeological sites. Not ideal for persons of limited mobility. Would definitely recommend it. My Wife, Son and I came to stay at The Bothy for two nights to celebrate our first Wedding Anniversary. We fell in love with the place very quickly, it's an enchanting, quaint place inside and out with magnificent surroundings and lots to do. Denise and her family are so welcoming and hospitable it was hard to leave and we wish we had booked to stay longer! We will definitely be back in the future and would highly recommend booking a stay here to anyone! We had an amazing time at the Bothy ! such a magical and warm place to rest and be close to nature that surrounds you. Denise is lovely and has helped us organizing our visits. It's perfectly located to hike on Snowdon and to discover the beautiful beaches of Anglesey. A must ! We had a lovely stay at the bothy ( which is handy for beaches and mountains.. ) Pity we didn t have warm sunny evenings as the sunset from the little slate terrace at the rear of the property was beautiful and would have made a great place to raise a glass of wine. , but the stove inside kept us warm and toasty instead! Lovely friendly owners too! Our stay at the Bothy at Coch Hir farm was delightful. It is situated in a wonderfully peaceful location, is charming, comfortable and nicely appointed. Looking through the kitchen windows evokes a sense of journeying back in time to days of green valleys and a simple uncomplicated life. We have particularly fond memories of falling asleep in the mezzanine while star gazing through the skylight above the bed, then waking to the pitter patter of rain trickling down the glass. Denise's vision in creating this delightful space is inspiring. Snowdon rising up from nearby Llanberis for walking, or taking the mountain railway to enjoy breathtaking views on a clear day. Lake railway and high ropes course, slate museum and woodland walks in the Padarn Park. Outdoor shops, cafes and restaurants. Magnificent castle built by Edward I in the World Heritage town of Caerrnarfon. The Welsh Highland Railway also starts from the town. Enjoy the views over to Anglesey as you walk round the castle walls and explore lovely little streets and shops. National Trust properties within easy reach - Penrhyn Castle near Bangor, Plas Newydd in Anglesey, on the banks of the Menai Straights Famous Bodnant Gardens in the Conwy Valley. Beautiful beaches and coastal walks on the Isle of Anglesey. The Victorian town of Llandudno 30 minutes away has two beaches, a dry ski slope, cable car and other points of interest on the Great Orme. Pony trekking in Waunfawr,(15 mins away) and also on Anglesey. Safe traffic free cycling or walking along 30 miles of recreational routes along disused railway lines.